Prosecutors in El Salvador have opened an inquiry following the suspicious deaths this week of a puma and a young monkey at the National Zoo. Prosecutors suspect the animals became ill through neglect. The investigation will also look into the death of a zebra at the same location earlier this month. Those deaths follow that of a hippo called Gustavito at the National Zoo in February, which caused outrage in El Salvador and beyond. 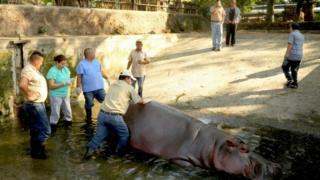 Staff initially said that the hippo had been stabbed and beaten by unknown assailants. Following the death, zoo director Vladlen Hernandez said he did not believe employees were involved in any attack and added that the zoo had received no threats from any of the street gangs that terrorise the Central American nation. Police later questioned employees of the zoo to try to establish who could have entered the premises to carry out such an attack. But investigators later concluded that the animal had died as a result of poor care. A detailed examination showed that the hippo had apparently died of a pulmonary haemorrhage, or bleeding from the lung, state prosecutor Mario Salazar said. The animal had been ill for 17 days before dying. The latest deaths at the zoo happened on Thursday night. The authorities say puma Soberana (Sovereign) was old and ill, and being treated for a gut problem. Reports say the baby monkey died in an accident. But prosecutors decided to look into the circumstances of the deaths. On Friday, El Salvador&apos;s Culture Ministry also announced it will revamp the National Zoo. "The traditional zoo concept is already obsolete," said the ministry in a statement. El Salvador&apos;s National Zoo will be transformed into a wildlife park, it added.